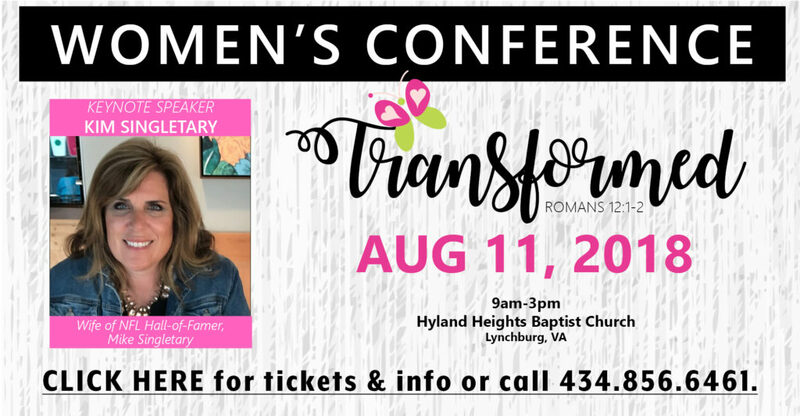 Strength and Honor Ministries Full-day Women’s Conference – Lynchburg, VA. Join women from all over the state of Virginia, including North Carolina, DC, and surrounding areas for this one-day event of fellowship and seeking the will of God. Enjoy a spirit-filled day of guest speakers, praise and worship, break-out sessions, luncheon, and more. Our keynote speaker will be Kim Singletary (wife of NFL Hall of Famer – Mike Singletary). Tickets are $35 and includes lunch. The conference will be held at Hyland Heights Baptist Church, Lynchburg, VA. Get your tickets today and Get Ready to be Transformed! Calling all Vendors! Click here to reserve your space now! Prizes, give-aways, lunch, vendors and more!